As the weather improves, thermal insulation might not be at the forefront of your mind. However, insulation isn’t just about controlling heat loss – it’s about maintaining a comfortable working and studying environment all year round. It’s an issue we take seriously at Metador: a surprising amount of a building’s total heat loss – a report from Haringey Council estimates about 40 per cent – takes place through its doors, windows and floor. 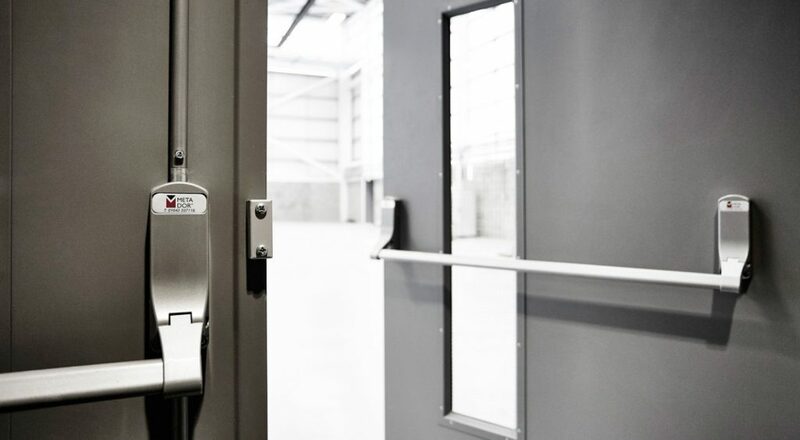 This is why we use the very best materials in each and every one of our doors, to ensure our products are helping you to control your building’s temperature and reduce heating costs. How is insulation measured? What is the R value? It’s important to understand how the thermal resistance of insulating materials is measured when choosing products. Thermal conductivity is the starting point, and relates to how easily heat flows through a specific material. This is also known as Lambda, and is measured in Watts per Metre Kelvin, written as W/mK. Here, the lower the value, the better. Industrial building materials usually come with a Lambda value of anywhere from 0.008 W/mK (very good) to 0.061 W/mK (not so good). However, this value does not reflect the thickness of the material in question. For this, a different calculation is needed, which will give us the industry-standard ‘R’ value. The R value is the thickness of the material in metres, divided by the Lambda rating. This gives a rating that is written as W/m²K, or metres squared kelvin per watt. Note that the total R rating of a door (or wall, or ceiling, etc) is calculated by adding the R ratings of all the insulating materials together. How does Metador insulate its doors? As mentioned above, Metador takes door insulation very seriously. There are a number of cheaper, inferior and less effective insulating products available on the market, such as cardboard honeycomb, for example. Rockwool is a natural stone-based insulation that is sourced from abundant lava deposits of volcanic rocks. It is re-melted, spun, made water repellent and bound together in a wool-like fleece. Rockwool is a mineral wool, which is inorganic and ideal for thermal insulation, fire protection, acoustic control and environmental purposes. It is durable, flexible and lightweight, which makes it ideal for the centre of our doorsets. It maintains its thermal resistance very well throughout the life of the doors. Why is insulation important in the summer, too? The same insulation that keeps your building warm in the winter can prevent it from overheating in the summer. If you have air-conditioned premises, it will also help to keep your air-con system operating as efficiently as possible. Bear in mind that, for the past four years, the average monthly temperature in the UK has only exceeded 18 degrees on one occasion, in June 2018 – so, even in warmer months, you should prioritise thermal efficiency when specifying doors. You can find more information about any Metador product on our product pages here. Alternatively, we’d always love to hear from you directly, so feel free to get in touch with any questions you may have. * Doorset size tested: 1090mm x 2090mm. Values vary slightly depending on size & finish colour. As per third party accreditation testing by Ceribois (notified body number 2061) to European Standards EN 1007-1 and EN 13126 on 23rd March 2016.